See The Top 11 Solar Businesses That Are Lighting Up Africa In 2016! This year will always be fondly remembered in history as the year Africa’s prospects for greater access to electricity took a huge leap. Early this year, the US Congress passed the Electrify Africa Act. This transformative law, which seeks to address the massive shortage of electricity in many parts of sub-Saharan Africa, would help our continent provide electricity to over 50 million people for the first time. The law, which now makes electricity in Africa a foreign policy priority for the USA, will open doors for billions of dollars of investments in power projects across Africa. This will include contributions from both the public and private sectors. But Africa is in a serious electricity crisis. Over 600 million people on our continent don’t have access to affordable and reliable electricity. According to the Economist, only seven countries in sub-Saharan Africa — Cameroon, Gabon, Ghana, Ivory Coast, Namibia, Senegal and South Africa — currently provide electricity to at least half of their population. And as more investment dollars pour into Africa in the coming years to lift the continent out of darkness, solar power projects, solar initiatives, solar businesses and ‘solar-preneurs’ will be a big attraction. Well, of all the potential sources of electricity for Africa – hydro, natural gas, coal, and even nuclear – solar power is the cleanest, cheapest, most practical and abundant. Solar has the best potential to connect far-flung corners of our continent, especially remote and rural areas that could take decades to access national electricity grids. It’s no surprise that solar has been identified as one of the Top Business Opportunities In Africa That Will Make More Millionaires In 2016, and in several years thereafter. In this article, you’ll see the ambitious businesses and ‘solar-preneurs’ who are working hard to bring electricity to more people on the continent through the power of the sun. Based in Tanzania, and confounded by three ambitious Oxford MBAs, Off Grid Electric provides pre-paid solar energy at affordable prices to people living off the grid. For just about $6 per unit, its home solar kit includes solar panels, LED lights, a meter, and a USB charger for cell phones. And using its ‘solar-as-a-service’ business model, customers pay via mobile phone to unlock the electricity they need. Off Grid claims their pricing is equal to or less than what customers pay for kerosene, batteries, and phone-charging services. To date, this business has installed over 100,000 of its units in Tanzania and Rwanda. If Off Grid continues to expand at its current rate, it would be on track to meet its plan of providing solar power to 1 million homes in East Africa by 2017. Off Grid already has an enviable list of investors and backers. So far, the business has grossed over $100 million in venture capital, debt finance, grants and awards. Recently, Off Grid Electric raised $25 million from international investors and won a $5 million grant from USAID. 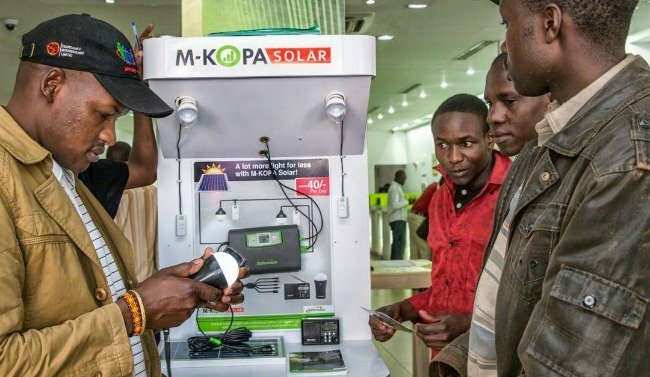 With 300,000 customers (and counting), Kenya’s M-Kopa started the pay-as-you-go solar revolution in Africa by tapping into mobile phone penetration on the continent. Founded by the same guys behind M-Pesa, East Africa’s transformational mobile money solution, M-Kopa is on track to replicate the same success. M-Kopa’s power system costs about $200, and includes a solar panel, two LED bulbs, an LED flashlight, a rechargeable radio, and adaptors for charging a phone. The kit comes with a two-year warranty, and its battery is designed to last at least four years. Although most of its customers are very poor and cannot afford the full price upfront, M-Kopa relies on its SMS-based mobile payments system to spread the payment. This allows its customers to make small daily payments, and most customers usually payoff in about a year. In February 2016, M-Kopa launched one of Africa’s first solar-powered digital TV sets, an impressive addition to its product range. Since M-Kopa started in 2011, it has attracted over $40 million in investments and is backed by the Bill & Melinda Gates Foundation and Safaricom. Nigerian entrepreneur – Chris Onwuasoanya – used to be a Vice President at JP Morgan Securities and worked with Merrill Lynch and Wells Fargo in the USA before he returned to Nigeria in 2013 to set up his solar business –Atlantic Waste & Power Systems. Despite Nigeria’s abundant natural gas resources and huge potential for power generation, most people in Africa’s largest economy receive no more than 2 to 4 hours of electricity every day. Chris couldn’t resist the urge to serve this 170 million-strong electricity-hungry market. Chris is one of a handful of entrepreneurs leading the quiet solar revolution in Nigeria, and West Africa. 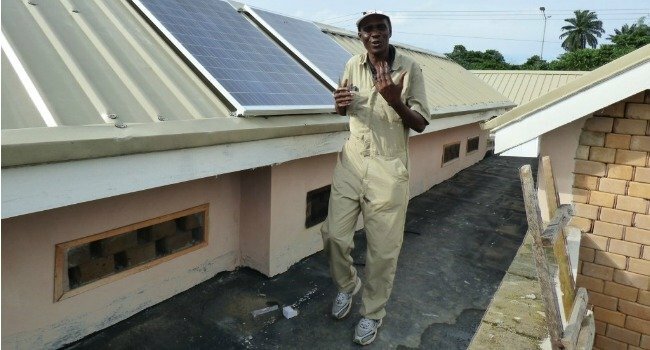 His business installs and maintains solar power systems for clients that include middle- and upper-class households, businesses and highbrow real estate developments in Nigeria and Ghana. 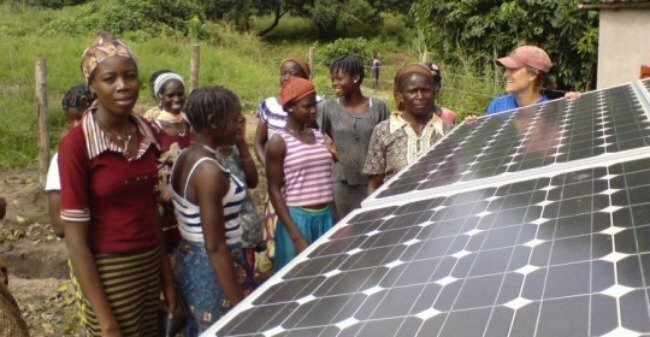 In 2015, Atlantic Waste & Power Systems announced a partnership to develop micro-grids and utility-scale solar projects in Nigeria with In Sun We Trust, a French solar electricity project developer. In 2015, Powerhive became the first private company in Kenya’s history to receive a utility concession to generate, distribute, and sell electricity to the Kenyan public. Based in California, USA, Powerhive is a solar micro-grid company with a difference; it originates, builds, finances and manages solar micro-grids, with customers pre­paying for Powerhive electricity using mobile money or scratch cards. Using its proprietary technologies, Powerhive makes money by selling its smart meter hardware and licensing its software to third parties. In markets where it deploys directly, it also makes money through revenues from end-user electricity payments. Some of the key investors in Powerhive are First Solar, the biggest U.S solar panel producer, and Total – the French global oil giant. 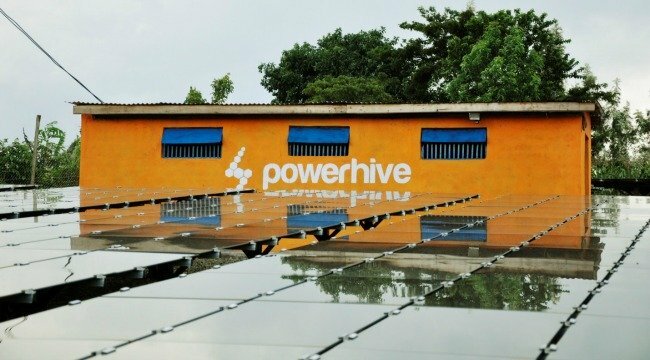 After successfully testing its solar micro-grids in four remote villages in Kenya, Powerhive plans to roll out electricity to over 200,000 homes in Kenya. Helvetic Solar Contractors (HSC) has installed more than 6,000 small rooftop solar systems in Tanzania and four other East African countries – Kenya, Uganda, Rwanda and Burundi. The company supplies, installs and maintains solar systems across the East Africa region, and its product range includes everything solar; from solar panels and water heaters, to battery banks and back-up units. Its long list of clients and solar projects include the UN, the Tanzanian government, World Vision and the Tanzanian Army. Helvetic Solar has installed solar water heating systems in government institutions and several UN projects including schools, hospitals and hotels. 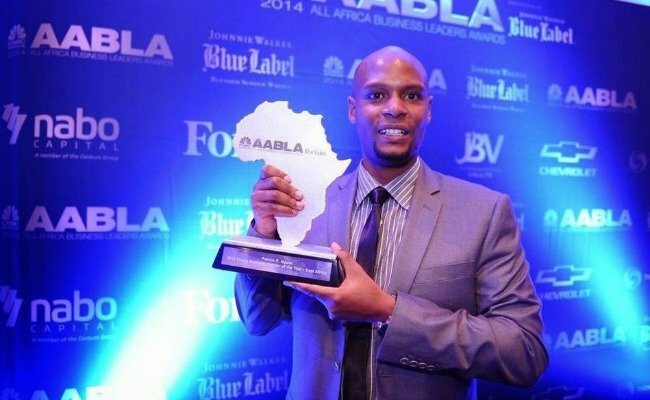 In 2013, this business made more than $5 million in revenues, and was ranked at the top of KPMG’s East Africa Survey of Top 100 Mid-Sized Companies in Tanzania in 2012. The brain behind the sterling achievements of Helvetic Solar is Patrick Ngowi, a young entrepreneur in his early 30s who has been featured by Forbes as one of Africa’s Top 10 Young Millionaires To Watch. Mobile phones are a big deal across Africa. And for many people on the continent, their livelihoods depend on it. Despite the widespread use of phones on the continent, accessing reliable energy to charge phones is a daily challenge for more than 500 million Africans. ARED, short for African Renewable Energy Distributor, is the brain child of Henri Nyakarundi who developed the Mobile Solar Kiosks, or MSKs. These mobile kiosks come with built-in solar panels which generate power to charge up to a dozen phones at the same time. ARED’s mobile solar kiosks provide a one-stop affordable charging station for mobile phone users and can be deployed in open and busy areas – markets, parks and streets. With several mobile kiosks already deployed in Rwanda and Burundi, these kiosks offer mobile money transfer services, mobile phone sales and call credit recharge in addition to the charging service. The most impressive feature of ARED’s business is its micro-franchise model which creates opportunities for ordinary people to use the MSKs to earn a living and supplement their income. Based in Nigeria, Quaint Global Energy develops renewable power projects – with a focus on solar, biomass and thermal. It recently received a grant of $1.3 million from the US Trade and Development Agency as part of President Barack Obama’s Power Africa Initiative. Quaint Global was also one of the winners of a $5 million co-development fund provided by Access Infra Africa. The company is currently working with its foreign partners on a massive 50MW ABIBA solar electricity project in Kaduna State, in northern Nigeria. Quaint Global Energy was named by Forbes in 2015 as one of Africa’s 5 Cleantech Startups To Watch. Karibu Solar Power has an interesting value proposition: it models itself as a social enterprise that makes energy available at the price of kerosene. A winner of the United Nations SEED Award, and the a 2014 Cornerstone International Business + Social Good Award, Karibu Solar is bringing affordable and sustainable energy solutions to marginalized Africans. The business designs, manufactures and distributes a solar pay-as-you-go “business in a box” kit in Tanzania. It sells this kit to entrepreneurs who then earn income from selling recharges to other people. Karibu Solar is working to expand to Cameroon and Nigeria, with the aim to bring solar lighting and affordable mobile phone charging to 1 million Africans within the next five years. Ugesi Gold is a South African social business that’s lighting up Africa as much as it’s empowering rural women. Its key focus is the electrification of rural and informal settlements. 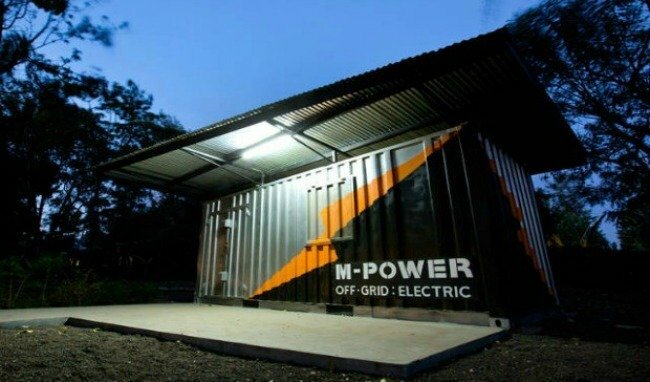 Its flagship product is the Solar Turtle; a standard 6m shipping container converted into a unique solar battery charging station where local people can purchase electricity by the bottle (special battery packs that look like water gallons). Ugesi’s plan is to start as many of these micro-utility SolarTurtle businesses throughout South Africa expanding to Sub-Saharan Africa in the near future. Its SolarTurtle design and unique approach to solar energy has earned it several accolades. 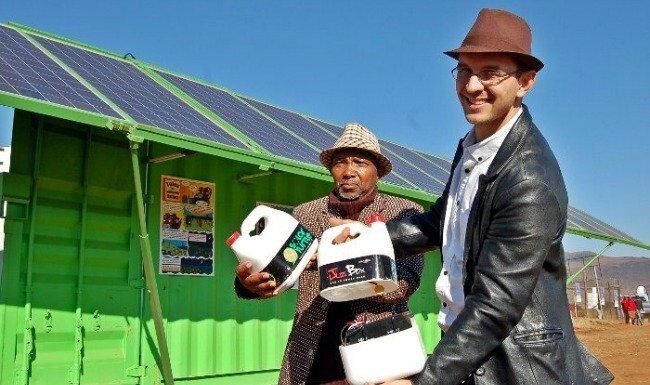 It won the WWF Climate Solver Award in 2014, and it has been named as a 110% Green Flagship Initiative by South Africa’s Western Cape government. SunnyMoney has one goal in mind: to eradicate the kerosene lamp from Africa by the year 2020. 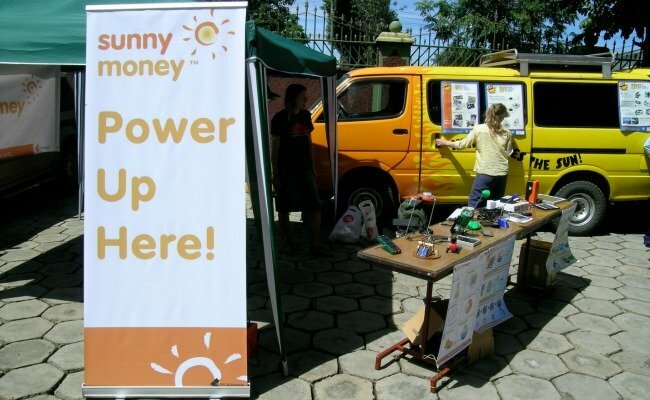 SunnyMoney is a social enterprise owned by the international UK based charity, SolarAid. With a presence in Kenya, Uganda, Malawi, Zambia and Tanzania, it is one of the most widespread solar ventures in Africa. It uses an innovative distribution model to sell solar lights in rural off-grid communities that are dependent on costly, toxic kerosene for lighting. Its parent organization – SolarAid – raises philanthropic funding for SunnyMoney’s expansion. SolarAid is also a leader in driving policy and advocacy for off-grid lighting and solar technology advancements internationally. Berlin-based Mobisol provides a range of solar home systems with an affordable payment plan via mobile phones. The business also offers a comprehensive customer service and innovative remote monitoring technology. To date, it has installed over 27,000 solar home systems across East Africa. Mobisol’s systems come in varying sizes from 80 to 200 Wp to match the various energy needs of different households. Its solar home systems provide enough electricity to power bright LED lights, radios, mobile phones and a variety of household and consumer appliances. The larger systems can also power small businesses enabling entrepreneurial customers to create additional income. I strongly believe that access to reliable and affordable electricity holds the keys to unlocking Africa’s economic, social and human potential. If the lights are always on, our factories will produce more (for cheaper), businesses and commerce will thrive, our hospitals will serve patients better, and students can study for longer hours. For every home and business these ‘solar-preneurs’ light up, they set off a chain of positive benefits that progressively change Africa’s future. Although there’s a lot of work and lighting up that still needs to be done, we are very proud of you guys for unlocking the power of the sun for Africa’s benefit. Next articleHELPING THE SNAIL TO COME OUT AGAIN!